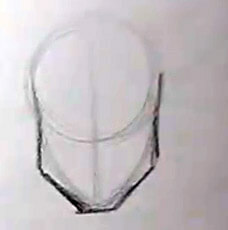 To get started with learning how to draw a cartoon male face, you’ll be using the same basic egg shape you’ve been drawing in the previous tutorials. But this time, instead of having the nice smooth jawline you’ve been making for the females, you’re going to need to make the jawline more angular. Just like with the female you can draw in the eye line for your character at the midpoint of the face. Don’t worry about using a ruler to get this measurement perfect, just eyeball it and practice judging distances without needing any tools. The more you can work without needing additional tools, the faster you are going to be able to finish your drawings. This might not seem very important when you are just starting out, so just tuck this idea into the back of your head and keep working. This tip will become more useful as you continue to develop as an artist because you’ll be able to create more work in less time. 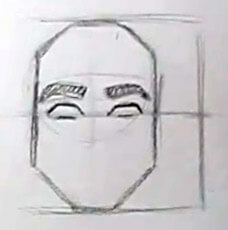 Divide the lower half of the face into thirds. You should be used to finding the placement of the nose and mouth by now by following these guidelines. At this stage of learning how to draw a cartoon male face, it’s important to note that both the male and female faces use the same system of guidelines. An added bonus here is this makes it even easier to master. After you’ve drawn in the features, you can draw a light line on each side of the chin that moves up to and will define the cheekbones. Depending on how thin and muscular you want your character to be the cheekbones will become more important to your character design. As the character design gets fatter, you’ll find that the cheekbones start to disappear. As you are going through your daily life take note of the people that you see all around you. Notice how the cheekbones look on thin or muscular people as compared to those who are average, and then to those who are overweight or even obese. Even though you are drawing cartoon characters, it’s good to notice how these features look on real people because they will help you create more convincing character designs. And you’ll have more confidence in your new or experimental work because it will be based from real people in the real world. 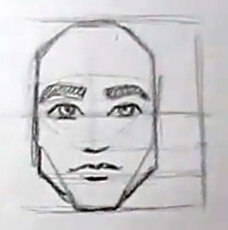 Draw the hairline in at the top third of the face and pay close attention to the stylized look of the hairline. The same unique shape happens on the female as does the male, but it’s more prominent and defined on the male’s face. Finish off the last details of the face by adding a small line under the eye to show where the bottom of the eye socket is and then draw in the ear. The ear attaches just like you have learned before with the top lining up with the outer corner of the eye and the bottom lining up with the lower part of the nose. 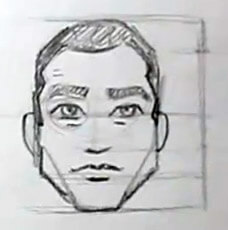 We hope you’ve enjoyed this article on how to draw a cartoon male face. See you next time for more awesome art tips!